A gentle Micellar Cleansing Water formulated to thoroughly remove makeup and impurities while soothing the skin. A blend of chamomile and refreshing cucumber leave a calm complexion that is soft to touch. Directions: Soak a cotton pad or cloth and gently wipe over face and eyes. 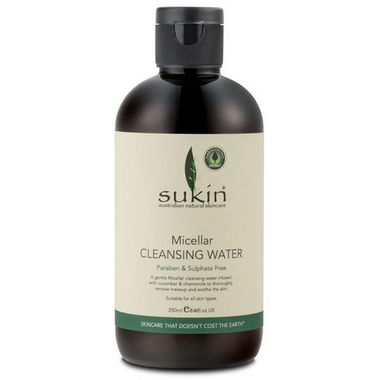 Follow with Sukin Foaming Facial Cleanser or Cream Cleanser. Love this product. It's so gentle on my skin and it removes makeup completely. The scent is also very mild. Will purchase it again. I use Micellar water to cleanse away city pollution then I use an oil face wash. My esthetician commented on how clean and glowing my face is. I like the smell itâ€™s almost a mild vanilla extract smell. I say worth a shot! Love this as a gentle eye makeup remover. Finally, a cruelty-free vegan micellar cleansing water! That's the main reason I enjoyed this so much, but it is also effective. I have extremely sensitive eyes, so it did sting a little bit but far less than many others I have used. Would repurchase. This is the best make up remover I have ever tried because it actually removes all make-up, effortlessly! Great at removing makeup quickly. Had a nice sweet vanilla scent. Alcohol is unfortunately one of the first ingredients. I carry a small bottle of this in my purse and do a mid day clean of my skin. It really does an amazing job of removing dirt and oil. I was hoping I wouldnt feel anything on my skin afterwards but that isn't the case, it does leave something behind, but not unpleasantly so. Still very happy with it and will repurchase. Lisa Eldridge recommended this micellar water, so I thought I would try it, and it seems effective so far -- it feels gentle enough too -- I presume the chamomile has a soothing effect. Really like this cleansing water. It leaves my skin feeling already cleaned. The price is a great bonus! Love the scent and the clean feel left after removing my makeup. This is meant to be followed by a cleanser and it does a great job of prepping the face. With rosacea and sensitive skin we must be careful what products we choose. This has been gentle and effective. Will purchase again. This product is gentle and cleanses well. It smells lovely. I'm very happy with the brand. However, I was disappointed to read the instructions that a normal cleanser is still needed after using miceller water. This was my first time buying miceller water. I probably won't buy it again. . . because I find it redundant to use both miceller and a cleanser. Irritated my skin and eyes. The alcohol in the product is just too harsh for my skin type. I was really hoping it would be gentle as it promised, but it just wasn't what it promised to be. Gentle but does a good job. Smells beautiful. Removes makeup very well and has a pleasant light fragrance. Leaves my skin feeling clean, soft and nourished. I would buy this again and I definitely recommend.